Maggie Czapski, a senior at Bishop Walsh School in Cumberland, credits time management skills and supportive teachers and coaches with helping her balance myriad commitments. Czapski was one of 60 seniors – three from each of the 20 Catholic high schools in the Archdiocese of Baltimore – honored by the Department of Catholic Schools at the 22nd Distinctive Scholars Convocation April 8 at Mount St. Joseph High School in Irvington. A four-sport athlete, Czapski played varsity soccer and basketball throughout high school, in addition to running cross country and track. Last fall, she was captain of the both the soccer and cross country teams. She is also a member of the marching band and campus ministry. 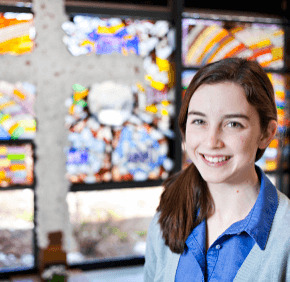 As a campus minister, Czapski helps plan liturgies and serves as an extraordinary minister of holy Communion. Bishop Walsh is a pre-K-12 school, and she began playing piano at school liturgies when she was in the eighth grade. Despite her busy schedule, schoolwork comes first. “I just do my work when I’m supposed to,” said Czapski, who has taken five Advanced Placement courses. She is a member of the National Honor Society, Spanish National Honor Society, TRI-M Music Honor Society and National Art Honor Society. Czapski plans to attend a Catholic college. Ann Workmeister, interim principal of Bishop Walsh, described Czapski as a leader and a role model for her peers.